The planked hull, complete with individually planked decks. 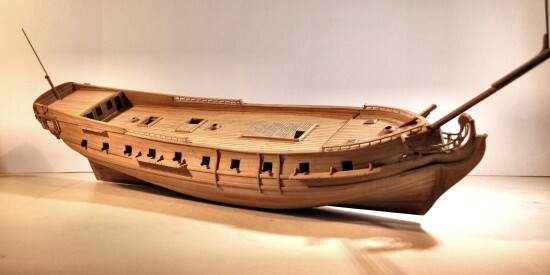 Care is taken to plank the ship in as much a similar fashion as the original ship would have been planked. 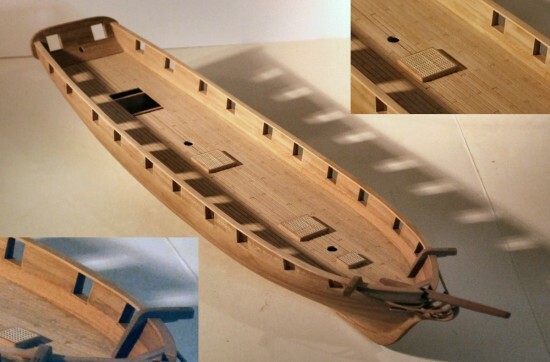 Gun ports are often built before the planking, so are all below-deck furniture and accessories that may still be visible through hatches and ports once the ship model has been completed. Great care is taken to maintain all the curves of the original in the model: sheer, camber, tumblehome, stern curvature etc. etc. The above image of the hull of HMS Ontario illustrates some of this. The United States Frigate President of 1800 under construction shown below. 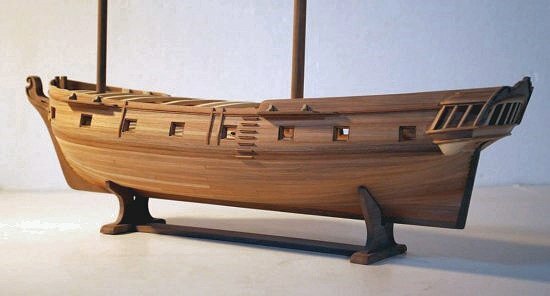 Hull construction of a model of the 1813 United States Brig Niagara shown below. The next step could be to built the top-handrails, wales and additional hull decorations. 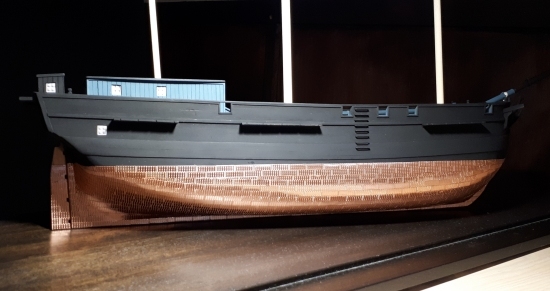 The hull may also have coppering below the waterline, such as shown directly below on a model of Hadlow, a convict transport to Australia. An expensive but effective measure if a sea-going hull was to last. Freshwater vessels did not received such treatment. These thin copper (alloy) plates were applied to counter the effects of mollusks, hull decay and ship worm such as the warm water Teredo. All cherry construction of La Concorde of 1710.